The Sweet Life: A Sugaring Family on Teamwork and Going with the Flow | Balancing Act | Kids VT - small people, big ideas! 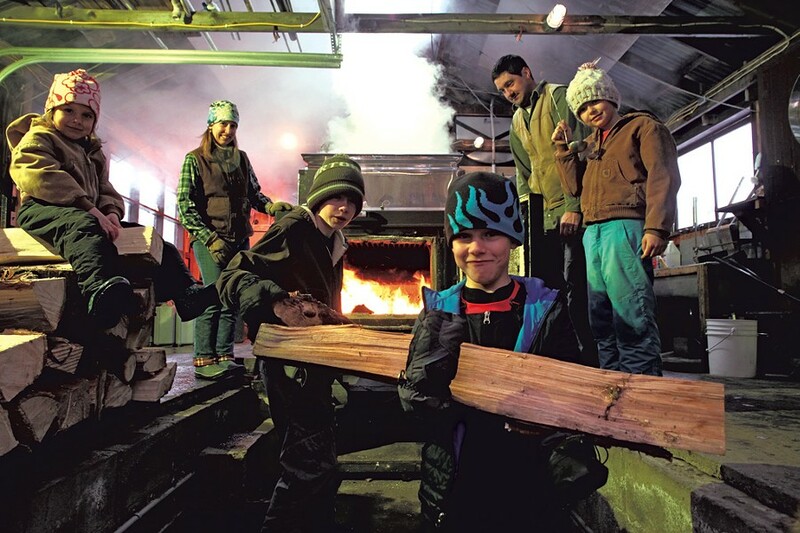 For six weeks in late winter and early spring, Marsha and Bill LaPorte of Underhill drop everything to sweat it out in their wood-fired sugarhouse over a giant pot of boiling sap. It's a duty Bill and his brother, Jim, took over 12 years ago from their grandparents, who started the small sugaring operation in 1980. The LaPortes own a business in Cambridge that prints labels for glass maple-syrup containers. They leave the print shop mostly to their two employees during sugaring season, when time is of the essence. Lines need to be checked daily to ensure there are no tears or snags, and boiling sap must be constantly monitored. This is the family's second year living in Underhill, in a house on the same property as their sugarhouse, purchased from Bill's grandparents. Prior to that, they commuted from Cambridge during maple season, sometimes making the 30-minute drive in the middle of the night to check on the boiling sap. Now Bill doesn't have to sleep in his truck anymore, and Marsha can huddle with him in the sugarhouse late into the evening as they make sweet syrup for family and friends. It's their version of date night. Bill: I get up at 5 a.m., take a shower, begin the lunches and wait for our daughter to get up because she likes to participate in making her lunch. Marsha: The kids get up at 6:30 a.m. and pretty much get dressed and eat breakfast themselves. We help a little bit, but they can do most of it on their own. Marsha: They have to do a lot for themselves: Get their backpacks ready and make sure they have their hats, mittens, snow pants, shoes. Bill: We are big believers in kids participating and doing things for themselves. Marsha: The chaos! You think the witching hour goes away when your kids are no longer babies, but it doesn't. Bill: Usually, whoever gets home first starts dinner. Marsha: Right. But 95 percent of the time, it's me. Marsha: ...Because we boil in the late afternoon and evening. 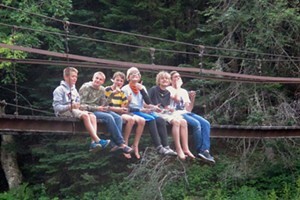 Hopefully, this year the kids are older and will be able to spend more time at the sugarhouse. Last year, I would pick them up from the bus and they would pretty much go straight to Bill's mom's. The sugarhouse can be a dangerous environment because everything is hot. Bill: ... or it's cold outside. Bill: When the sap runs, you have to get as much as possible. You can't store sap very well; it will either freeze or it will spoil. Marsha: We have tubing in the woods, so you have to make sure it's all connected and working properly. It's a job we both do. It just depends on who can leave their other work. Bill: Who can ignore their work [at the printing business] to go walk in the woods! You need to be in the woods, that's a priority. Boiling has to happen; walking in the woods has to happen. The kids understand this, and our employees understand this. Bill: We signed the kids up for the Smugglers' Notch ski program this year since we knew that would make us go. We have plenty of other things we could do on those Saturdays, but at least it makes us get the kids up there. I learned to ski when I was very young, but Marsha did not. Marsha: I can ski now, but it's a huge regret that I didn't ski as a child. We are close enough to Smuggs. Our kids should ski. Bill's mom taught 3-, 4- and 5-year-olds to ski for 30 years, and she's now retired — she's 70 — but she took the four grandchildren to Smuggs by herself last week. Bill: You'd never know she was 70. She is amazing! Bill: The kids expect it now. Marsha: For a while we were both reading, switching kids. Bill: And we were like, Why are we doing this? One person can do this and the other person can get a break or do something else that needs to be done! Bill: It's much easier with employees now, more sleep involved. Marsha: The kids are older now. It was really hard when they were 2 and 4. It was chaos doing it all with two businesses. Bill: Living next to the sugarbush, you can get a lot done. Instead of spending half a day splitting wood, you can do it in an hour or two. Marsha: Yes! We are a team through it all: the house, the printing, the sugaring, the kids.